Climb the obvious rail from left to right. Easy moves provide encouragement, until the rail gets smaller near the end. 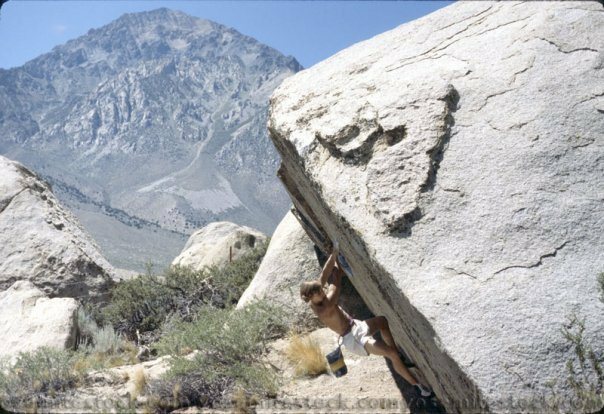 Good incuts and determination help gain the sloper out on the right lip. Match on this and swing your right foot high and complete a classic. Tough line if you are under 3ft. Pulling the final rockover on the Iron Man, V4. Mike flashing the Iron Man, V4. Getting the sloper on Iron Man, V4. Unknown climber on the iconic Iron Man Traverse. I think this one is Dale Bard's! FA Iron man Dale Bard! Low to the ground, fun moves, approachable, flat landing, gorgeous rock, lovely looking.... you can see why this might be the most photographed problem on the planet.